(CNN) -- Two men held in the Netherlands may have been trying to test U.S. airport security by putting bottles with electronic devices attached in checked baggage, a U.S. law enforcement source said Monday. The men were taken into custody after landing in Amsterdam on a flight from Chicago, Illinois, Dutch prosecutors said. 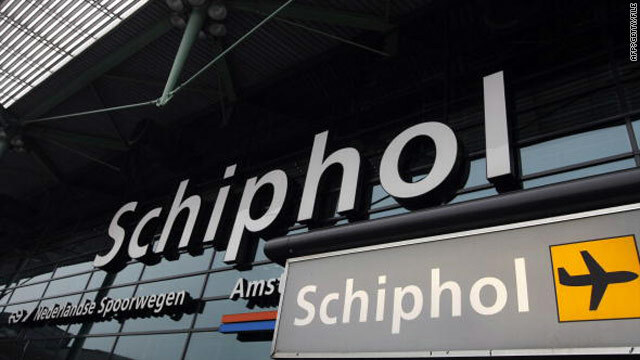 Both men were being held at Amsterdam's Schiphol International Airport at the request of Dutch national police, airport spokesman Robert Kapel said. The U.S. Department of Homeland Security said they were arrested after "suspicious items" in their luggage raised concern. "The items were not deemed to be dangerous in and of themselves, and as we share information with our international partners, Dutch authorities were notified of the suspicious items," the U.S. agency said. "This matter continues to be under investigation." Those items were an empty shampoo bottle with watches attached to it and an empty bottle of a stomach medicine with mobile phones attached, according to the U.S. law enforcement source, who has been briefed on the investigation. That has raised concern that the men may have been testing a future terrorist plot, the source said. Attempts to sneak liquid explosives aboard jetliners were at the heart of a 2006 plot broken up by British authorities. That case led U.S. authorities to ban all but small quantities of liquids from aircraft cabins. U.S. law enforcement officials told CNN that the checked bags contained knives and box cutters as well. Passengers have been banned from carrying those items on aircraft since the September 11, 2001, attacks on New York and Washington. The source identified the men aboard United Airlines Flight 908, from Chicago, Illinois, to Amsterdam, as Ahmed Mohamed Nasser al-Soofi and Hezem al-Murisi. Al-Soofi began his trip by boarding a flight in Birmingham, Alabama, and al-Murisi originally flew from Memphis, Tennessee, the law enforcement source said. Another U.S. law enforcement official said both men were in the United States legally, but their countries of origin were not immediately known. That official said neither of the passengers were carrying items that are barred from aircraft, and federal air marshals were aboard the Chicago-to-Amsterdam flight. However, the law enforcement source said al-Soofi was ticketed for a flight that went to Washington's Dulles International Airport, with continuing stops in Dubai and Yemen, while both he and al-Murisi were aboard the Chicago-to-Amsterdam flight. Al-Soofi's luggage went aboard the Chicago-to-Washington flight without him, the source said, in what amounted to another violation of U.S. safety protocols. A U.S. government official said items in at least one of the bags were being examined by law enforcement authorities at Dulles on Monday night. The official said al-Soofi and al-Murisi were seated near each other on the Chicago-to-Amsterdam flight, but were not seated next to each other. Authorities are still looking into whether the men were traveling together or simply had similar itineraries, the official said. CNN's Nic Robertson, Jeanne Meserve, Mike Ahlers and Susan Candiotti contributed to this report.